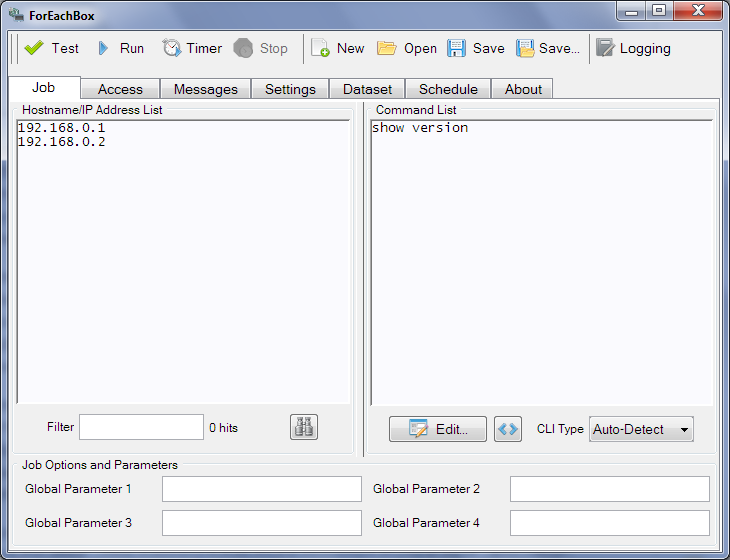 ForEachBox is a scripting and automation tool for various Cisco devices. It supports the command line interface of the Cisco Nexus, IOS and ASA series. 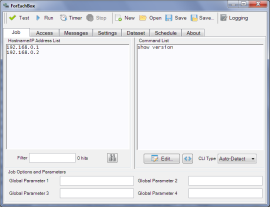 It is implemented as a Java GUI and requires the Plink tool that is included with PuTTY. It features command macros, which allow Expect-Send clauses and dynamic parameters in commands. Results can be saved to files or condensed in data collections. ForEachBox is packed as a Java JAR file, which can be started by either double clicking it in the file browser or by running the command "java -jar foreachbox.jar". Also available is a Windows executeable, which is basically a wrapper and also sets some optimized parameters for the Java VM. You need the JRE 1.4 or later installed on your machine to run it. ForEachBox does not use a setup; just copy the file ForEachBox.jar to a working directory. All generated logging and projects files are also stored in this directory by default. ForEachBox requires one programm included in the Putty package, Plink. This program is used for the actual SSH or Telnet connection to the device and is started as a hidden process. Download and install the Putty package and copy the Plink binary into the same directory as the ForEachBox binary. You can also select the binary from a different folder within the ForEachBox program under the settings tab. To get started with ForEachBox, enter the IP address or hostname of network devices, the commands to send to the device and the user account to login to the device. The "Test" button allows testing the settings on the first device in the list to see, if the settings work. See the ForEachBox Docmentation for more information. For support forum and contact see the BerliOS project page. ForEachBox is an automation tool, which can change settings of many devices at one click. Special care should be taken using this software and the test option be considered. I shall not be held responsible for any harm or damage caused by this software, including system or network outages, costs for restoring to a previous state or damage to the management systems. This software is provides as-is, use at your own risk. ForEachBox is copyright 2013 Volker Semken. Cisco® and IOS® are registered trademarks or trademarks of Cisco Systems, Inc. and/or its affiliates in the United States and certain other countries. Apple and OS X are trademarks of Apple Inc., registered in the U.S. and other countries.